Among the most widely sought Canada postage stamps, the Canada Early Issues mark the period spanning 1903 until 1943. 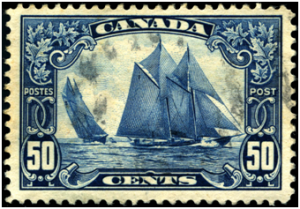 In addition to being highly sought-after in general, this particular era of stamps contains a famous stamp that depicts the “Schooner Bluenose,” being among the most famous stamps available to stamp collectors in Canada. This era was followed by Canadian stamps of the Canada Modern Issues, which ran from 1944 to 2013. The stamps of the Canada Early Issues span four different British Kings, being King Edward VII, King George V, King Edward VIII, and King George VI. They also encompass the onset of World War II, and reflect the military atmosphere of those years with depictions of military scenes, as well as showing King George VI dressed in military uniform. Also of note in this time span is that it marks the beginning of the Canadian Post Office’s decision to authorize the use of picture postcards in Canada, as well as the start of insurance against lost money or belongings sent via mail. King George V, in a stamp that began in 1911 wherein he is depicted as the Admiral of the Fleet. This stamp ran until 1928 and is considered by many to be an admirable design. Stamps depicting King George VI are widely sought, with 3 stamps in particular from May of 1939 commemorating a royal visit. A war issue began in 1942, noting Canada’s contributions to the effort, including King George VI wearing the different uniforms of the various military branches. Still others noted Canada’s part in providing food, and how Canada was instrumental in producing munitions. A peace issue followed in 1946 that noted economic growth throughout the country. If you are a philatelist interested in Canada Early Issues, call Treasure Coast Stamps. We have information about these and other interesting Canadian postage stamps.